Invite the neighbors over for a Sundance® afternoon. With a large hot tub like the Hartford™, you have plenty of room for family and party-size groups. Inside you'll find enough room for six or seven adults. You'll also find a generous number of jets: 42 in all, in five different styles, offering a variety of hydro-therapeutic hot tub massage options. Which means you and everyone else in your Hartford spa can enjoy an almost unlimited variety of massages. A built-in multi-beverage holder keeps drinks close at hand. Enhanced water filtration, plus factory-installed CLEARRAY® , make the Hartford hot tub easy to maintain. 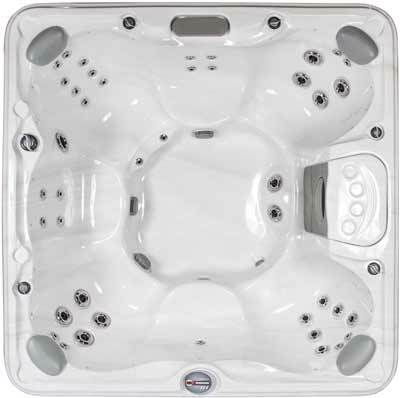 Favorite features, like waterfalls, molded beverage holders, and comfy pillow headrests are standard on this hot tub. And with Custom Luxury (CL) features like stainless steel jets and seductive in-spa LED lighting, the Hartford is not only one of our large spas, but also one of our luxury spas. Just as quaint New England charm mixes with modern life in Hartford, Connecticut, this high-performance spa brings welcome relaxation to your busy day. Dimensions - 7'4" x 7'4" x 36"